She's worried about the state of public schools. She prays that our schools don't run out of chalk. Today is February 22. George Washington's birthday. I know, I know, President's Day was yesterday. I'm going old school. Nothing against Lincoln, Abe's cool, but I decided I'm not on board with the joint birthday celebration in the guise of a government holiday. President's Day doesn't mean much except sales on linens and appliances. Home goods. We shop for good deals on home goods. This is what we do to recognize and remember the two greatest Presidents of the US? Towels and refrigerators? I like Mt. Vernon, but if that's the connection between George Washington and sales on home goods it's a weak link. So. I decided that it's time to take a stand. I'm taking back George Washington's birthday. George Washington is my favorite president. And I will no longer stand by and watch him reduced to a shared birthday with little or no remembrance other than local appliance retailers dressing up as George and making cheesy jokes about him in an attempt to lure shoppers into their stores. I know, I know, as long as there are locally owned appliance stores there will be cheesy ads with owners/spokespeople dressing up and mocking whatever holiday/theme is current. All the Krazy Larrys of the world aren't going to stop their fun and frivolity just because I find it disrespectful. And really, I don't want all that to end. I like local advertising. It has a quaintness, a charm, a palpable air of desperation that I find refreshing in comparison to slick, highly produced, well-acted, ultra vivid national advertising. Local advertising is real. Often real-ly bad, but usually sincere. Unlike national retailers or high-end products, locally owned retailers need to advertise. They need customers. So they'll go to whatever cheesy extreme they can imagine to lure viewers' attention to their great deals on whatever they're selling. As long as there's a guy in a turkey suit or George Washington costume selling appliances, there's still a local retailer who hasn't succumbed to Death by Walmart. I'm kind of protective of George Washington. Like I said, he's my favorite president. Our only truly independent president. No party affiliations. I like that about him. A long, difficult war was fought for US independence. It would be hypocritical and kinda weird for the guy elected to preside over the US, the first President, to turn around and depend on, take sides with, a particular group of people with a particular, exclusive, political point of view and agenda. That's what the Revolution was about - getting out from under oppressive taxation without representation, sure - but breaking free of titles and labels and antiquated monarchism and plain old biased favoritism. And agendas. There was a document written, maybe you've heard of it, an actual declaration of independence. Breaking free, living free, not burdened by political or religious oppression...it's all very idealistic, of course, and freedom isn't actually free. Freedom is more expensive than a lot of people realize. But. I'll pay the toll. And dag nammit, I'll honor my favorite president on his actual birthday. He's not some whiny twin child who doesn't want to share his birthday with his sibling. He's the father of a country. He was an independent. So his day, his memorial, should be independent, his own. I went through a coin collecting phase when I was a kid. Okay, it's true, once a coin collector, always a geek. I wasn't interested in coins because of the value factor. I was interested in coins (and stamps, too, go ahead, make your jokes) because of the art and the history of the nation they represent. I learned a lot about different countries' histories thanks to the coins my father brought home from abroad. But it was always the US quarter featuring George Washington that served as my gold standard by which all other coins from all other nations were judged. George Washington looked so strong, so responsible, so capable compared to some of the leaders portrayed on coins from other countries. One of my uncles used to bring me old coins that he found in his spare change. Every time he arrived I sheepishly waited, hoping, that he brought me some coins, too polite and shy to ask. Eternities would pass and finally he'd say, "Oh, I almost forgot! Trillian, I got some interesting coins in my change the other day. Why don't you have a look at them and tell me if they're worth anything? In George we trust, eh Trillian?!" In George we trust. Amen. I've been thinking about that lately. In George we trust. That phrase always brings a smile, I can hear my uncle, see him conspiratorially grinning and winking at me. I'm done with President's Day. I'm declaring my independence from the treachery of The Man, The Man who decided it's more practical to lump Washington and Lincoln's birthdays together for a combined holiday. I'm exercising my right to freedom from political oppression. February 22 is George Washington's birthday. I'm celebrating that day. My mail will be delivered and my bank will be open, but I won't go to the mail box or the bank on February 22. It's my defiant act of solidarity with George Washington. *I'm waiting for the day there's a Chia® Rock 'n Roll series. Chia® Elvis. Chia® Beatles (and you know the Chia® people have pitched that) Chia® James Brown. Chia® Hendrix. Chia® Rolling Stones. Oooo, Chia® Bob Marley. Chia® Clash. Chia® Nirvana. Chia® Red Hot Chili Peppers. 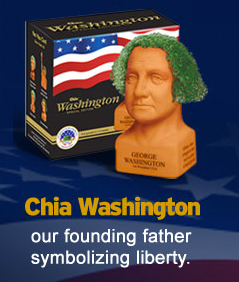 Chia® Flaming Lips (something tells me Wayne would be down with that)...the possibilities are endless.